On my first trip to India in 2010, we were encouraged to wear simple Indian garments in an effort to not draw attention to ourselves as obnoxious Westerner tourists. Jumbo pants, billowing tops, and always a scarf draped around our neck and flowing down our back to indicate we were not "available.” Our aim was to blend in and not be disruptive in appearance in the temple visits and sacred ceremonies to which we were invited. As I continued to travel to India my intention with my appearance changed. Now we go and are encouraged to be beautiful women of Bhakti (devotion.) We ornament ourselves and look as lovely as we can for Krishna and the other deities. The Indian women champion our wearing of devotional clothing which helps to subdue any feelings of cultural insensitivity. They seem honored we are adopting their customs. This is the first year in four that I didn’t travel to India. (It’s been a year of not doing a lot of things I normally do, but it’s also been a year full of meeting brand new people and sharing new experiences with them.) My eyes and heart have been open to this newness and the feelings it brings. I’m learning to be happy where I am and make the most of things. I’ve become obsessed with the ladies with whom I share the streets of Harlem. I feel like I’m back in India walking amongst queens! I try not to be intrusive with my photo taking; they are all just so beautiful. Riding the subway, buying an apple from the corner fruit stand, walking their children home from school — any everyday mundane activity — they all look like they’re on their way to something special. Just like the ladies in India sweeping the dirt, working in the fields, or squatting down to cook dinner — any everyday mundane activity — they too, look like they are going to be with royalty. Follow Busayo on Instagram, go to her pop up shops when they are in your city, or just sit and gaze at this photo and feel calm. Her designs are stunning and her clothes are all made in Nigeria. I am honored she is my friend and can't wait to share my dress with you! They’re dressed deliberately, intentionally, regally. It’s so inspiring. I even commissioned a dress from my Nigerian fashion designer friend Busayo! I am especially taken with these ladies' head wear. My favorites are the colorful wraps in graphic textile, or when I see fabric draped with just the sweet ovals of faces peeking out. I’ve seen bows, knots, twists, turbans — I had to have one. My obsession grew. I wanted to look as beautiful as they did. I wanted something I could slip on to control my crazy curls. I looked in all the stalls in my neighborhood but I couldn’t find one that suited me. I researched, I looked online. My friend Destan, who is privy to all of my obsessions, shared Regalwraps with me — a company owned and operated by his friend the actress Kim Hawthorne. Handmade! Pre-tied! A friend’s company! This was too good to be true. I knew buying fabric and learning to tie and wrap wasn’t a practical choice for me. My head wrap arrived in the mail and I love it! Look how perfect it is! I wore it around the house, I immediately took pictures and shared them with Destan. But then I was faced with a quandary: Cultural Appropriation. Oxford dictionary defines cultural appropriation as “the unacknowledged or inappropriate adoption of the customs, practices, ideas, etc. 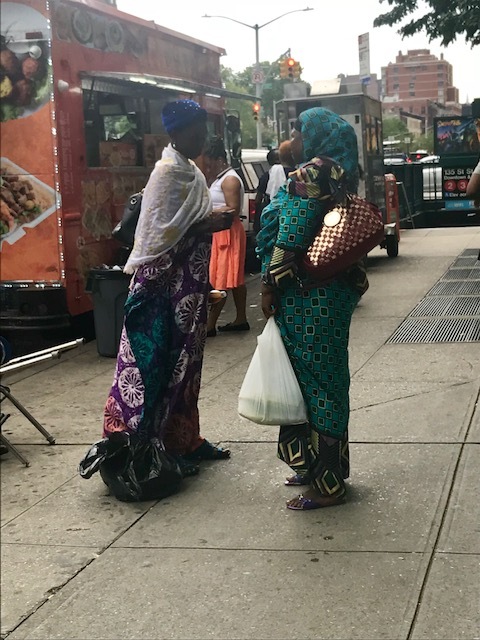 of one people or society by members of another and typically more dominant people or society.” Is my white girl head wrap wearing and African textile buying offending the women of color in Harlem and the world at large? Good gravy, I hope not! I knew I needed to research the African point of origin for the head wear. I wanted to knit my admiration, inspiration, and respect into the history of this ethnic dress I’ve come to love. The pattern I chose is Kente, probably the best known of the African woven cloths, was worn by political authorities and high-ranking officials of the Ashanti people. Each intricately designed piece of fabric conveys messages about historical and cultural landmarks, philosophical concepts, political thoughts, or religious and moral values of society. In kente cloth made by the Ashanti people of Ghana, gold represents status and serenity. Yellow represents fertility (like the ripeness of an egg yoke or a fruit) and vitality. Green signifies the renewal and growth seen in plants and represents the cycle of birth and decay. Red connotes passion, the passion of political determination, struggle, and defense. Ashanti also believe that red holds protective powers. Black denotes seriousness and a union with ancestors. It implies spiritual awareness. All. Good. Things. My friend Christopher shared a valuable article on black fashion culture that further confirmed my need to know the point of origin of my choices. Especially as a white woman who has the freedom to dress as I please. Robin Givhan, fashion critic, Washington Post spoke on fashion designers having freedoms too, “with that freedom comes the responsibility to also recognize that it behooves you to understand the culture you’re pulling from. If people just went one step further in understanding the history, many of the offenses people feel would disappear. Because it often seems to come out of ignorance. Or laziness.” As consumers of fashion we have the same responsibility! My dear friend Erika and her daughter Charley - I asked her what the head wrap conversation is at home in LA where they live. "I keep our convo simple now since she's so young. She has a silk wrap that I put on her hair at night. I just tell her it protects our hair. She doesn't know any different. It'll get harder when sleep overs start. But I remember NEVER wrapping my hair at a sleep over. I didn't want to deal with all the questions." I learned the head wraps use or meaning can vary depending on the country and/or religion of those who wear it. Tied upward or downward, at the back of the neck or under the chin — certain wraps are worn for ceremonies, funerals, weddings, initiation rituals, etc. In addition they are worn during sleep to protect the hair. Resurgence in African pride, especially among the youth, has led to its usage in many Western nations outside of Africa. “As a form of apparel in Zimbabwe, the head-wrap has been exclusive to women of African descent. In the United States, however, the wrap took on a whole new meaning. “During slavery, white overlords imposed its wear as a badge of enslavement! 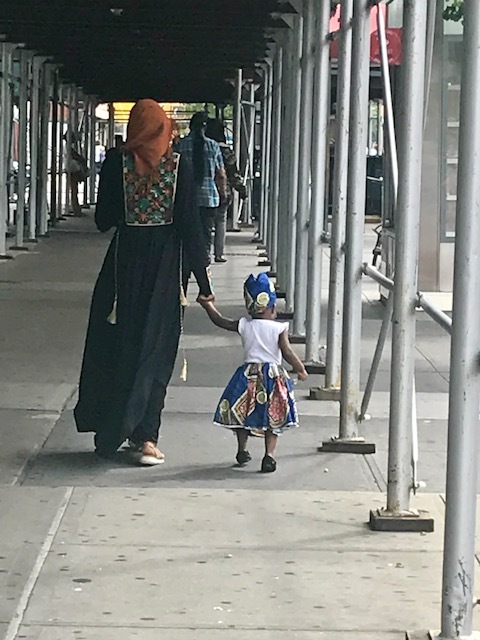 The enslaved and their descendants, however, have regarded the head-wrap as a helmet of courage that evoked an image of true homeland — be that of ancient Africa or the ‘newer homeland’ of America. The simple head rag worn by millions of enslaved women and their descendants has served as a uniform of communal identity; but at its most elaborate, the African American woman’s head-wrap has functioned as a ‘uniform of rebellion’ signifying absolute resistance to loss of self-definition.” WOW, right? A famous head wrap we know began with the women fulfilling a patriotic duty to join the work force while men were fighting in World War Two. Up until 1944, black women were limited to janitorial or cafeteria jobs. Due to the increase in demand for workers, roles in production were now available to black women. It has been said that it was the process of white women working alongside black women during that time that encouraged a breaking down of social barriers and a healthy recognition of diversity. QUEENS! “The African head-wrap works as a regal coronet, drawing the onlooker’s gaze up, rather than down. In effect, African women wear the head-wrap as a queen might wear a crown.” Aha! 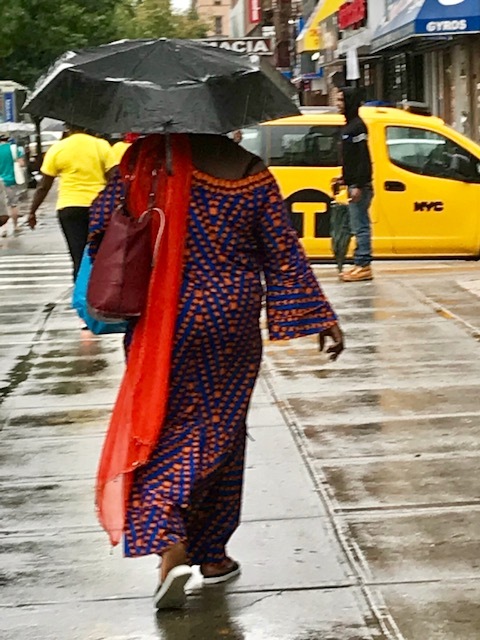 whether in India, Africa, or Harlem, New York — I can celebrate global fashion and accessories and feel empowered and beautiful like a queen when I wear them! As long as I respect their point of origin. My intention was to share a recipe for an African stew this week but I didn’t organize myself to get it made and photographed in time. Instead I have a mistake that ended up being a keeper. 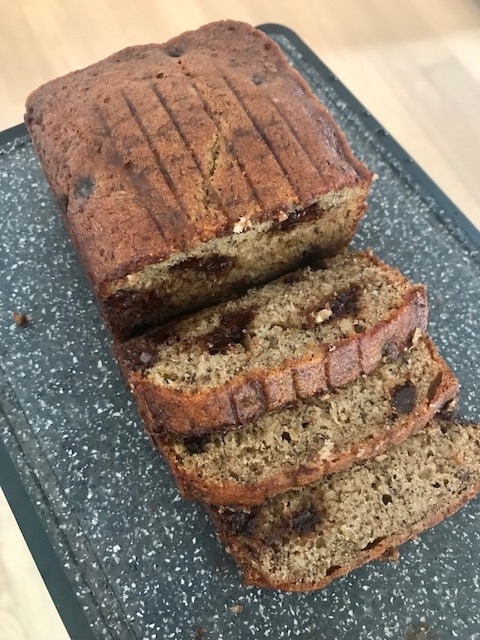 I've been baking Betty Crocker's banana bread recipe (with a few of my own tweaks) for years and years. I've always added a teaspoon of ground cinnamon. This last time I made it, I accidentally grabbed the Indian savory spice Garam Masala. Ooops! Guess what - it enhanced the chocolate and banana and I’ve been instructed by friends to permanently incorporate this mistake! Heat oven to 350 degrees. Grease bottom of two 9x5x3 inch loaf pans. Mix sugar and butter in a medium bowl. Stir in eggs until blended. Add bananas and water; beat 30 seconds. Stir in remaining ingredients except chocolate just until moistened. Stir in chocolate. Pour into pans. Bake until wooden pick inserted in center comes out clean, about 55 to 60 minutes; cool 5 minutes. Cool completely before slicing or it might fall apart and be difficult to slice into pieces.